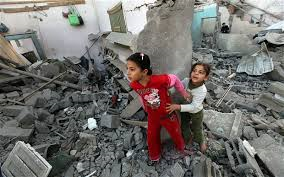 I can’t get it out of my head, the situation in Gaza. It is never very far from my thoughts, my conversations, my actions these days. It haunts me. Why this? My friend asked me. There have been so many terrible things happening around the world, Syria, Somalia, Afghanistan. Why do you feel so strongly about this? I think about it. And what I say to my friend is that I see Israel’s atrocities in Gaza as man’s inhumanity to man writ large, and I can’t bear it. The slaughter of men, women and most terribly, children all of whom are completely powerless to do anything about it. The injuries and the trauma, the lack of basic facilities and the loss of homes. The terrorising of ordinary civilians – people that could be you and me. Ordinary mothers and fathers, grandparents, sons and daughters. People told to flee their homes before they are bombed, only to be killed in what should be safe havens, like UN schools. When I saw those children killed in the UN school this week, I remembered Dunblane, when Thomas Hamilton killed 16 defenceless children and one teacher 18 years ago. I remembered how shocked and upset we all were back then, how distraught we were for the parents, how we felt for the whole community, how we hugged our children a bit closer and knew that it could as easily have been our school, our children, our community. We called it a massacre. We vilified the one man who did such a terrible thing and we did what any decent society does to make sure it can’t happen again. Why is it so different for the children of Gaza? There have been at least 245 children killed as I write this, since this conflict began, massacred by the state of Israel just as surely as Thomas Hamilton massacred those 16 children in Dunblane. Yet still our Government, and others in the West don’t raise a voice in protest and instead abstain on a UNHRC resolution to investigate Israel for war crimes; a resolution that would have at least given Israel the message that their behaviour in Gaza is unacceptable to the international community. The sight of those little shrouded bodies being carried for burial by fathers, grandfathers, uncles, brothers, cousins, friends, whoever is left in the family to carry them, whilst their mothers, grandmothers, sisters weep, clinging on to each other for support, distresses me beyond belief. That could be us. How can we allow a state like Israel to do this to children? I ask myself. And I am beset with the same powerlessness that all these families in Gaza face, unable to answer their children when they ask them if they are going to die. Using up all their energies trying to get to a safe place, where their children can sleep unharmed, only to find that it too is a target of Israeli attack. This is a war on children and Israel is responsible. With so many people packed into such a small area and half of them children it can be seen as nothing less. To me the Israeli state is like an abused child who becomes an abusive adult. I know that many Jewish people abhor the actions of Israel, and many protest and speak out against it, sometimes at cost to themselves, but I heard just yesterday that almost 90% of Jewish Israelis support their Government’s actions. And last night I was faced with the unedifying sight of the Leader of the Israeli opposition justifying the killing of children, justifying the continued bombardment, and like many abusers, blaming the victim. Like many abusers, unable to reflect on their own abuse, and ending up recreating it in the abuse of others, exerting their power against those weaker than themselves because once, they were the powerless. But it’s not good enough. Like child abuse, it has to stop. 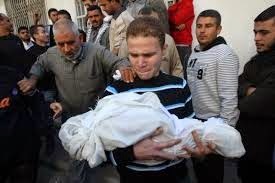 And as we intervene with child abusers, the international community needs to intervene with Israel. So I protest, and I write, and I email politicians, and I sign petitions and I share them on twitter and facebook and anywhere else that I can, and I take my specs to go shopping to make damned sure that I never buy another Israeli product. And though it never it seems enough, it’s what I can do.